Savvy Spending: Kohl's: Victor Allen's Coffee K Cup 80 pack for just $14.99! Kohl's: Victor Allen's Coffee K Cup 80 pack for just $14.99! 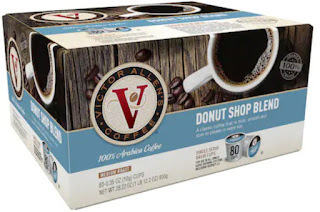 Kohl's has the Victor Allen’s Coffee K-Cup 80-Count Packs for only $14.99 (regularly $24.99) – choose from Donut Shop, Colombian Roast or French Roast! Certain market area may be able to use promo code MVCFREEOCT or OCTMVCFS at checkout for free shipping! You can also earn Kohl's Cash and Yes2You Rewards on these products. You can start at Top Cash Back for an additional 3% cash back. This makes them about 19 cents each, which is a GREAT stock up price!! I just ordered a year's supply and earned Kohl's Cash and got 3% cash back as well!